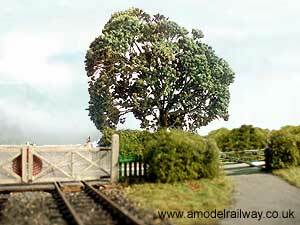 This model railway layout sits on the opposite side of the oval from Misterton. It measures 12' x 1'. 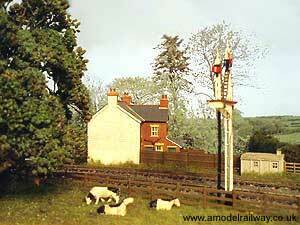 The objective was to provide a good stretch of line in open countryside to view trains in action and a place to assemble trains to run through Misterton, known in the hobby as a fiddle yard *. A survey along the line west from Crewkerne reveals the perfect location - Hewish Gates. 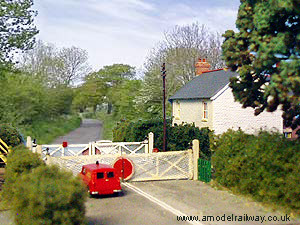 In reality Hewish is a hamlet to the west of Crewkerne and nearby is a level crossing known as Hewish Gates. 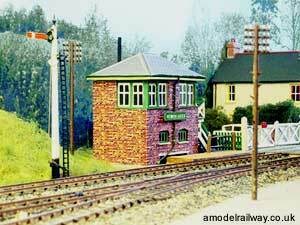 In the 1960s a signal box, railway cottages, passing loop and goods siding existed there. Nowadays only a single track and half barrier crossing remain. * Fiddle yards are usually hidden off stage to store rolling stock and make up train formations. 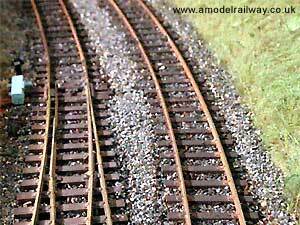 Here, train formations are made up on the model railway and a tray at the front stores most of the rolling stock. Crewkerne tunnel lies between Hewish and Crewkerne. On the model it was better placed to the west of Hewish Gates. It is an ideal exit off stage. The other end of the scenic break is disguised with a large tree. How I made the backscenes for Hewish Gates. Hewish Gates level crossing. Where does the model finish and back scene begin? A pastoral scene beside the railway. 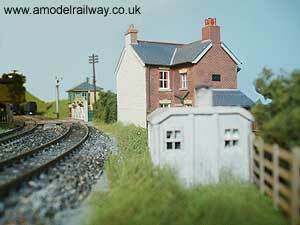 Lineside hut, cottages and level crossing. Entrance to the goods yard. In the 1960s a mix of flat bottom and bull head track was common. 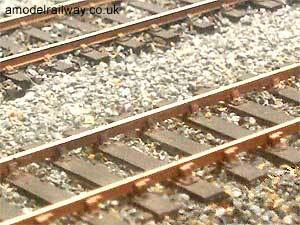 The ballast is blackened between main line rails due to oil and muck deposits from trains. 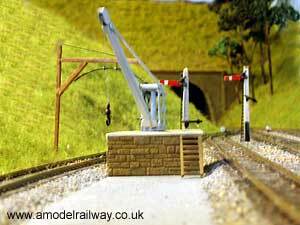 An old map shows a yard crane and semaphore signals here. 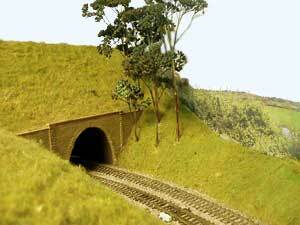 Crewkerne tunnel modelled from a H.C Casserley photo showing pine trees near the portal. Scroll down this page to view track plan.